Posted on Thu, Feb 23, 2012 : 4:54 a.m.
A clay pot roaster is a beautiful oven-to-table serving dish. "You call yourself a food writer and have never cooked in clay?" "When you're raising kids and working, you've got to find easy ways to do things, and cooking in clay ranks top. Just throw some dry rice, leftover vegetables and a seasoned chicken in the pot and roast," he said. "It's nothing fancy but it sure tastes good." JC assembling his Clay Pot Chicken and Rice. After his divorce, he was awarded full custody of the clay pot. "It was perfect for a single man as I could eat from the pot for days and there was only one dish to clean. Roasting chickens is my favorite way to use the pot, and my recipe is loosey-goosey, varying according to leftovers." In the same spirit, I used the leftovers I had on hand, substituting Brussels sprouts, for example, for the cherry tomatoes he used and a rosemary rub for his Cajun blend. Since JC met my friend Kathy, he's relinquished his single man status and cooks his specialty for her on a regular basis. Last week, I visited them in Colorado so, by default, was included on his guest list. While the pot soaked, I watched him prepare the chicken and studied the book he provided me: “The Complete Guide to Claypot Cooking" (Bridget Jones, Salamander Books, London). Season bird, place butter under skin, stuff with bay leaf and onion and tie legs together. According to the book, "...Claypot cookery is, in essence, a means of creating full-flavored dishes with the minimum of effort...Using terra cotta pots that have been soaked in water prior to cooking, is one of the oldest traditions and dates back to Roman times...The soaked pots absorb water which generates moisture during cooking creating a unique cooking environment." This seals in flavor and keeps food from drying out, so there is no need to add extra fat. I couldn't wait to try the recipe in my own kitchen. JC used an all-clay unglazed Romertopf roaster. According to Saveur.com, the Romertopf was invented by a German and is modeled on an ancient Etruscan design. Today, they are produced in Mexico with the same mixture of clays as the originals. I couldn't find an unglazed clay pot at local stores but was delighted to find a 4 1/2 quart clay roaster at Downtown Home and Garden, with a glazed bottom and unglazed lid. 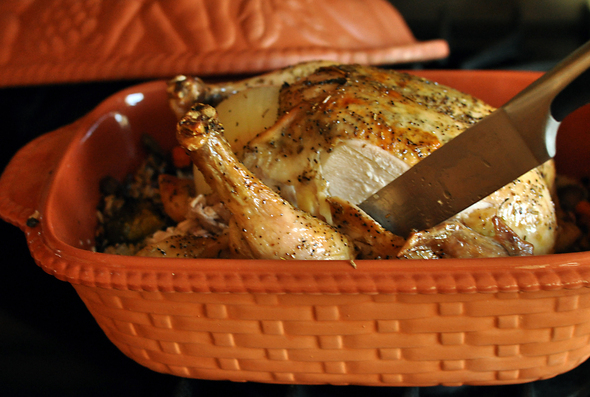 The moisture absorbed in the large domed lid distributed moist heat producing a tender, evenly-cooked, golden bird. The aesthetics of cooking in a natural, earthen element are pleasing; a beautiful oven-to-table serving dish. Delighted with my new toy, I purchased Paula Wolfert’s Mediterranean Clay Pot Cookbook. Wolfert — dubbed the Queen of Mediterranean cooking by the Los Angeles Times — describes herself a “clay pot junkie” and her recipes look absurdly good. "I like cooking with a clay pot much better than a slow cooker," JC said, as we savored his simple feast. "Vegetables don't turn to mush nor do they loose nutrition in liquid, and the rice has this incredible flavor and texture." I remarked that the rice was, indeed, incredible from the chicken fat it absorbed. "And your problem is...?" he responded. 1. Soak unglazed clay according to manufacturers directions, approximately 15 minutes. 2. Combine rice, liquid, mushrooms, carrots, and Brussels sprouts at bottom of pot. Combine rosemary, salt and 1 teaspoon of pepper (adding additional pepper to taste), and rub inside chicken cavity. 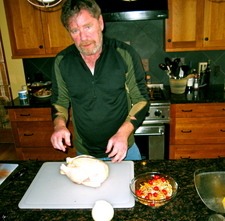 Lift up chicken skin and rub under skin, then over the exterior skin. Stick pieces of butter under skin over breast. Place chicken over rice mixture. 3. 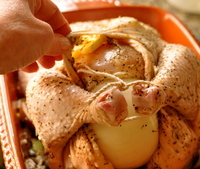 Place bay leaf in back of cavity and stuff with onion, if using; tie chicken legs together with string or kitchen twine. Visit AnnArbor.com contributor Peggy Lampman at dinnerFeed.com for more seasonal recipes and local value. You may follow her at twitter.com/dinnerfeed to get daily mini-recipes. Thu, Feb 23, 2012 : 11:56 p.m.
Thu, Jun 7, 2012 : 1:23 a.m. I haven't had any concern with our clay bakers. We bought ours from www.romertopfclaybakers.com and I know they import or have them made in Mexico. We've loved the meals with these things. Thu, Feb 23, 2012 : 6:52 p.m. I remember something about people getting lead poisoning from clay? pitchers they bought in Mexico. Any risk with these clay pots?